It is a wet morning in September of either 7 or 9 AD, and the might of Rome is on the move. In response to a series of reports of unrest by their ally Arminius, chieftain of the Cherusci and trained veteran of Roman campaigns, Governer Publius Quinctilius Varus marshals the three powerful legions under his command- the XVII, XVIII and XIX- and heads out from his fortified stronghold and deep into the Teutoburg forests of Germania. Around them trees rise up into the sky, and there is a fine rain falling, coating the forest in that dreamy quality reminiscent of fairy tales. His men are of good spirit- some have brought along their wives or merchants- to show them the unstoppable power of the legions when brought to bear against inferior forces. It will be a glorious march, and at the end a vicious battle. Nothing the legionnaires had never experienced before. Nothing they had never defeated before. Business as usual. Varus was following the standard protocol for dealing with instances of unrest. Despite the relative small size of the legions proportional to the population of the Empire, Rome asserted control often through an early form of “shock and awe.” Mobilize the largest force it could, march straight into the offending region, and completely slaughter whomever was challenging the sovereign right of Roman rule. This is how Rome maintained control, how she gave experience to her career soldiers, and how she funded her military forces in times of peace and consolidation. And, with a few exceptions, it worked wondrously. The legions moved slowly, almost single file, through the forest, their supply train trailing far behind them. Bird called to one another. Animals cleared a path. 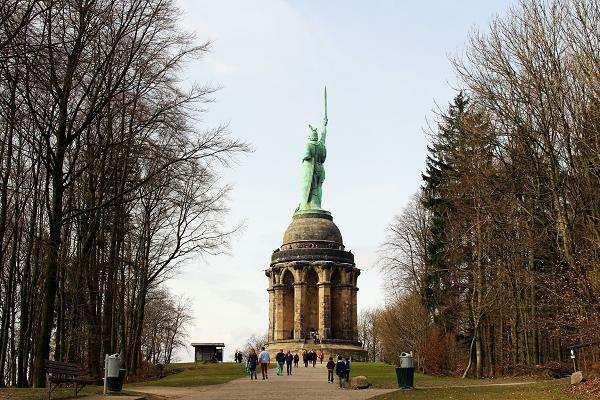 The legionnaires laughed and joked as they made their way into the forest at Teutoburg Wald. Sure the rain was becoming annoying, and the constant pressure to keep marching was uncomfortable at best, but these were skilled fighters, a true career force, and such nuisances were just that- nuisances. Even when the heaven opened up several days into the march, and soaked through them, loosening straps and adding undue weight to their armor and shields, the warriors kept pace, moving ever further into the forests. The mighty legions were on edge, growing anxious, but nothing more. Nothing they were not trained for, or at least that was the general line of thought. When Arminius took his men and rode off ahead to “clear the forest” for Varus and his legions, they were already sapped by fatigue. Trusting their Germanic allies, the column slowed to a crawl, stuck in both literal and mental mud. The thousands of German warriors moving off ahead might have seemed like a relief, perhaps a lucky moment of rest for the Romans. What happened next might be obvious to us, aware of its place in history. But for the arrogant Varus and his men, it was a surprise on the same level as the Parthian massacre at Carrhae, when the equally arrogant General Crassus made the same mistakes for the same reasons, and ended up with the same outcome. The Teutoburg forest came alive with the battle cries of the Cherusci and their allied tribes. Up and down the column, German warriors poured from the trees and tore into unprotected Roman flanks. Unable to form up into a battle position, and missing pieces of armor and arms that had become ungainly due to the rain, the Roman legions buckled, with some fleeing into the trees, and right into the arms of the waiting “barbarians.” As death spread, and blood was shed, the legions broke and ran, eager to put distance between themselves and the attackers, for some open ground to fall back to a defensive stance, and maybe salvage the remainder of the expected battle. But this was not to be. Alone in the forest, with enemies flooding from all sides, Varus made the decision to press forward still, leaving behind supplies, wounded legionnaires, and noncombatants in a fortified campsite. The position would be lost by nightfall, and the proud tribesman would remain on his tail. For days the massacre continued as the energized and enthusiastic tribes meted out their frustrations and their anger on the Romans who had mistreated them, and ultimately underestimated their strength. They picked off column after column, harassing the soldiers who were unable to bring their tactics to bear, tactics Arminius was well versed in himself. The legions split, with some finding sanctuary in a small fort, but with most cut off and eventually wiped out. Who can say what Varus was thinking in those moments before his position was overrun, and he committed suicide rather than fall to his “allies” in the forest of Teutoburg. Did he reflect on how gullible he had been to trust a man who was native to the province and skilled in both terrain and tactics? Did he regret his treatment of the local people, who had joined Rome through reputation, but he treated as conquered subjects? Did he question his own abilities as a soldier, politician, and governor, and how all this had failed because he had never stopped to think about what he was doing and how he was doing it? Or did he curse the forests and their unending stream of warriors that defeated three of Rome’s finest legions? This we will never know. But on that day in Teutoburg Wald, Rome suffered a blow to its pride that would take years to avenge, and a wound that never quite healed. It forced Rome, the principle power of its day, to pull back its expansion and set a solid border along the Rhine river. It exposed the folly of overconfidence, and the value of respect. And it was reminded that despite its power and reach, the determination of people can have far-reaching consequences to the arrogant and unprepared. Rome would again try to expand into Germania under emperor Marcus Aurelius. He occupied the Hungarian plain, Modern Slovakia and Czech Republic. He was planning to create two new provinces called Marcomannia and Sarmatia, but his death stopped these plans.